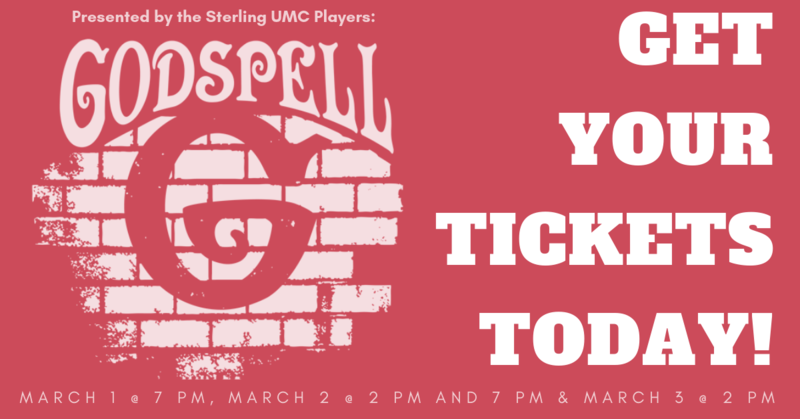 The Sterling United Methodist Church Players will present the musical “Godspell” on March 1, 2, and 3! This performance is a production of the 2012 revised version of the original 1971 musical composed by Stephen Schwartz. Godspell follows the story of Jesus Christ as he forms a community of lovable disciples, who teach lessons through songs and skits under His direction. It is a high energy, hilarious performance that is sure to be enjoyed by all ages. The performance is co-directed by Sharon Rosenfeld and Andy Vest featuring a cast of local youth ranging from 6th to 12th grade. Music direction is by Willis Rosenfeld and light production by Matthew Pepper. We would love to see you and your family at the show! If you would like to be a Patron of the Arts and support this and future shows by joining one of our “Giving Circles” with your name included in the program, please submit your donation by February 17. The different categories are as follows: Disciple $1 – $24; Apostle $25 – $49; Saint $50 – $99; or Angel $100+. no later than February 17. Godspell was conceived and originally directed by John-Michael Tebelak with music and lyrics by Stephen Schwartz. Originally produced on the New York stage by Edgar Lansbury, Stuart Duncan, and Joseph Beruh. Godspell-2012 Revised Version is presented through special arrangement with Music Theatre International (MTI). All authorized performance materials are also supplied by MTI. www.MTIShows.com.